Danger, S. (2009). Producing the Romance of Mass Childhood: Kate Greenaway’s Under the Window and the Education Acts. Nineteenth- Century Conrtexts, 32(4), 311–333. Lloyd, J. (1995). Ruskin and Women. Journal of British Studies, 34(3), 325–350. Lundin, A. (1994). Kate Greenaway. In (L. Zaidman, Ed. )British Children’s Writers 1880-1914. Literature Resource Center. Lundin, A. (1995). Kate Greenaway’s Critical and Commercial Reception. Princeton University Library Chronicle, 41(2), 124–146. Lundin, A. (1998). Writing Kate Greenaway: Carrier-Bag Autobiography. In Children’s Literature (Vol. 26, p. 164–`84). The John Hopkins University Press. Lundin, A. (n.d.). Under the Window and AfternoonTea: “Twirling the Same Blade of Grass”. Lion and the Unicorn, 17(1), 45–56. Neighbors, H. (1929). 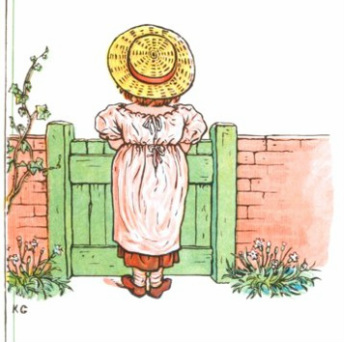 Kate Greenaway- Children’s Artist. The Elementary English Review, 6(4), 95–97. Ruskin, J. (n.d.). Fairyland: Mrs Allingham and Kate Greenaway. Tiffany museum in Florida is setting for book discoveries. (2007, June 10). Ventura County Star. All pictures are from the Project Gutenberg version of Under the Window.